SCOTTSDALE, AZ--(Marketwire - January 7, 2011) - Ever see something new and say, "now why didn't I think of that?" SWIH, a multi-purpose, personal bottle holder and body cooler, is one of those revolutionary products. SWIH, an acronym for So What It's Hot, was invented by physician Dr. Eva Liang, an outdoor fitness buff, as she was trying to get her "pre-baby" body back by rollerblading in the Arizona heat. SWIH (pronounced swee) is a lightweight and easy to use device that allows a water bottle to be worn at the back of the neck. The device is also a very effective body cooler when used in combination with a frozen half-liter bottle of water. SWIH stands out over existing products as it is the only device on the market that can offer both cooling and hydration. Current products which are used for cooling purposes, including neck coolers, misters or fans, do not offer a method for keeping the user hydrated. Research shows that hydration during a workout is even more important than staying cool. On the other hand, products that allow a user to carry fluids for hydration, such as water bottles, canteens or camelbaks, do not offer any type of cooling method. SWIH solves both problems while being both comfortable and convenient. With the SWIH, your bottle can be tucked neatly behind the neck and out of the way from twisting torsos and swinging arms. An added benefit of placing the bottle at the back of the neck is that it can protect the cervical spine from whiplash or frontal impact. SWIH is perfect for those looking to reduce heat stress and keep hands free for outdoor activities such as hiking, running, cycling, golfing, tennis, rollerblading or snow skiing. Staying hydrated and cool for any type of physical activity improves both performance and endurance. The device can be worn in 2 different ways -- around the neck or as a headband. 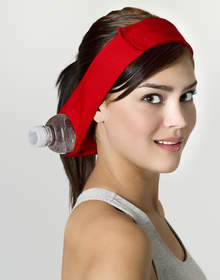 Either option allows the wearer to keep the bottle at the back of the neck. Three different sizes allow for this flexibility of wear. The SWIH is also thin enough that it can easily be worn under a hat or helmet, even when it's worn as a headband. Special introductory price is $14.99 plus shipping. For more information, or to order this product, visit, www.myswih.com.